While no one is going to argue that the fears surrounding the spread of Ebola in the U.S. and around the world are a good thing (except supervillains, I guess), it has had one interesting effect: Downloads of mobile game Plague, Inc. have spiked 50 percent in the last two weeks, according to the developer. Plague, Inc. puts you in the role of the virus itself. You pick how you evolve, changing symptoms, infection vectors and lethality to create the most infectious cocktail of danger you can. It's not a surprise, then, that some people have a macabre interest in thinking from the point of view of the virus, creating worst-case scenarios for an outbreak while news channels are filled with word of a real virus. James Vaughan, the London-based developer behind the game, hopes the game can be used for positive effect rather than just apocalyptic fantasies. "People are curious about [Ebola] and want to know more about infectious diseases," Vaughn said in an interview with Polygon. 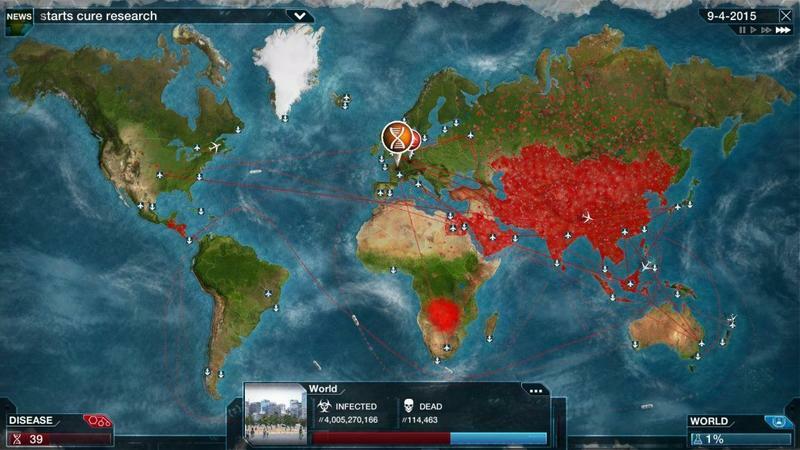 "Plague, Inc. can play a role because it's an intelligent look at how infectious diseases spread." Vaughan says that he wants to help in any way he can, raising funds and awareness, and says he's talking to some major charities to see if the game can be used as a helpful tool in some way. The game isn't built to mimic Ebola and Vaughan says he has no plans to patch that in, but hopes that better understanding of how these sorts of diseases work can help people understand how they spread and affect not just some distant country, but the world community.